Before the Citadel Expansion the Rorqual was mostly a toy for Mining Forman Links and ore compression in the field. 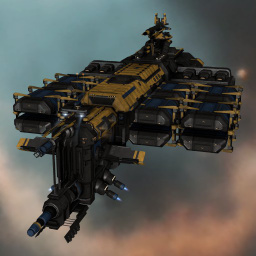 Nowadays it's a serious weapon for the industrial backbone of major nullsec alliances and also sees use as a PvP ship as well, using its high drone damage and capital tank to good effect. Further information about additional or recommended skills to pilot Rorqual for a specific or it's common role(s) can be written here. Your high slots and your two utility mid slots may change according to what you're doing. Always keep: The Industrial Core, the Cynosural Field Generator, the Capital Remote Shield Booster, the PANIC module. The heavy energy neutralizer, the smartbomb, the Drone Link Augmentor (some people use two), and the shield command burst (for your own local tank purposes if you get dropped on) can be changed according to what you prefer. Consider a CONCORD Capital Remote Shield Booster. The mid slots should be the same as shown, you may elect to use T2 Adaptive Invulnerability Fields and T1 (Meta 0) Capital Capacitor Boosters. If you get dropped, you'll definitely want Shield Boost Amplifiers in place of the Drone Navigation Computers; if you have problems with people messing with your Excavators you may prefer a Warp Disruptor in place of one of the DNCs, and swap in some Drone Damage Amplifiers in the lowslots. When you come into the mining area, drop a mobile depot first, then send the mining drones out. Wait until the Mobile Depot finishes anchoring BEFORE you hit the Industrial Core. The Capital Remote Shield Booster helps you save your mining drones from attack and can be used to help subcap miners tank Mercoxit damage. Tanks 24K DPS as shown, 52K DPS if you use two Shield Boost Amplifiers and pop Improved Blue Pill. Not a Battle Rorqual. Not meant for unsupported areas. Do not use Rorquals in times of high unrest. Avoid using the Rorqual for mining command bursts - command bursts give the pilot a weapons timer, which inhibits his ability to refit off his Mobile Depot. • Rorquals cannot enter into High Security Space. This page has been accessed 265,893 times.